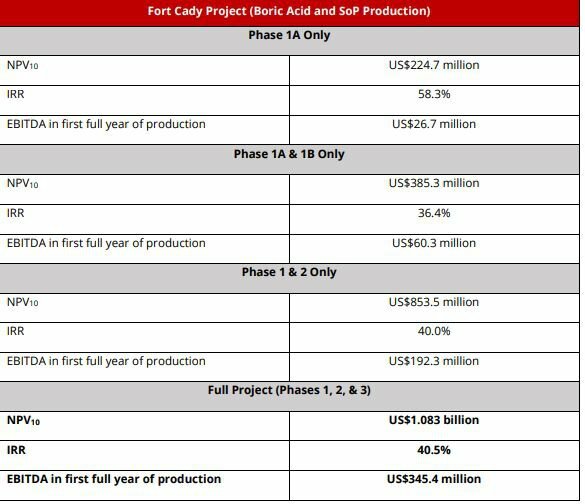 American Pacific Borate (ASX:ABR) has enhanced its Fort Cady Borate Project DFS released on 17 December 2018 to include a low capex starter project. The starter project is likely to change the game for ABR and was achieved by splitting Phase One into Phase One A and Phase One B, with Phase One A targeting the production of 40k stpa of SOP (potassium sulphate or K2SO4) and 6k stpa of boric acid (H3BO3). Phase One B will increase boric acid production to 90k stpa. The benefits of doing this are many and varied, however importantly the project substantially reduces pre-production capex from US$138 million to only US$36.8 million. That is an initial capital reduction of over $100 million. Furthermore, pre-production capex has been reduced by around 75% whilst total capex has only increased by around 7%. Overall, the project delivers exceptional financial metrics and is financeable on a standalone basis. Also important to note is that this enhancement is likely to mean lower share dilution whilst preserving the targeted larger project and valuation. “We are delighted with the enhancements of the DFS to include a low capex starter project that works on a standalone basis,” said ABR CEO Michael Schlumpberger. “We now have pre-production capex of only US$36.8 million and a pathway to Phase Three that has an annual EBITDA in the first full year of production of over US$340 million. “We have made the Fort Cady Project easier to finance, whilst limiting likely share dilution and preserving a massive EBITDA target in full production. The following table highlights the positive financial metrics for the Fort Cady Project. The Phase One A financial metrics means ABR can target financing this project in isolation, whilst creating a sensible pathway to full production and an EBITDA target in the first full year of production of US$345 million. The table below summarises the production targets by each construction Phase. The targets have not changed from the initial DFS. The numbers couldn’t come at a better time for ABR, with Grand View Research estimating the global lithium-ion battery market is projected to reach US$93.1 billion by 2025 while growing at a CAGR of 17% during the forecasted period. Furthermore, borate producers should continue to benefit from increasing demand for glass and ceramics across Asian countries where there is an absence of boron resources. 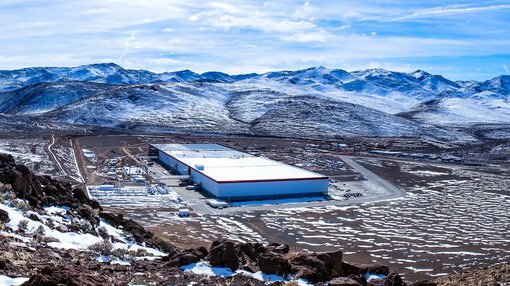 Given the location of the project near America's lithium hub in Nevada, which includes Tesla's Gigafactory, it could be an interesting 2019 for ABR.